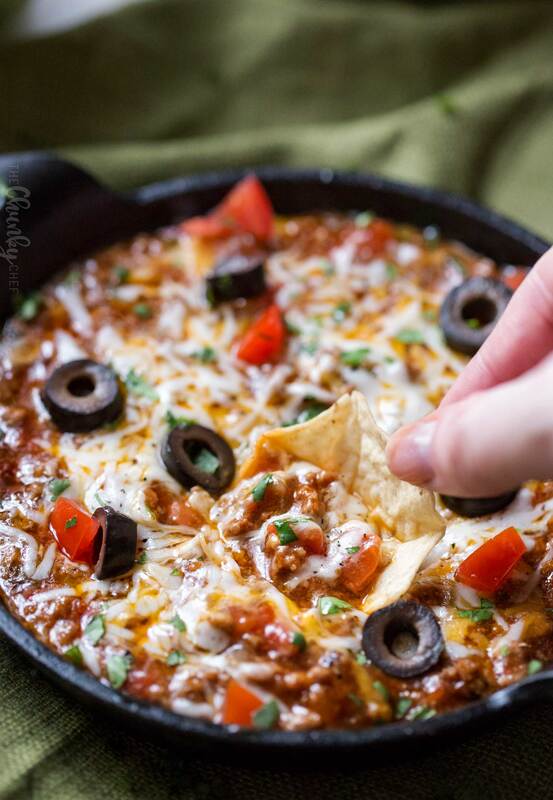 The ultimate tasty slow cooker taco dip! Loaded with fantastic taco-night flavors, and perfect for a party, this dip simmers away in your slow cooker, so you can enjoy the party and your guests! 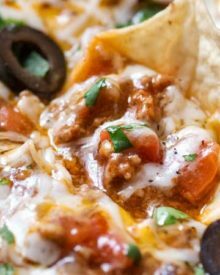 Perfect for game day or a fun appetizer night, this slow cooker taco dip is positively loaded with great taco flavors. 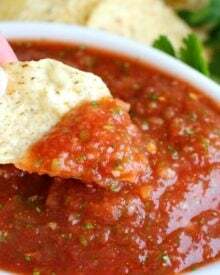 I use my homemade taco seasoning blend, but you can use a packet if you prefer. Make it for your next party and watch it disappear! You guys. I just realized there is a HUGE empty spot here on The Chunky Chef. I don’t have nearly enough taco recipes!!! I love tacos… as in, I could literally eat them everyday and never get bored. So I should have tons of them here on the blog, and yet I don’t. Shame on me. I think it’s honestly because tacos can be tricky to photograph, but still… mark my words, you will see a few more taco recipes here over the next 11 months! 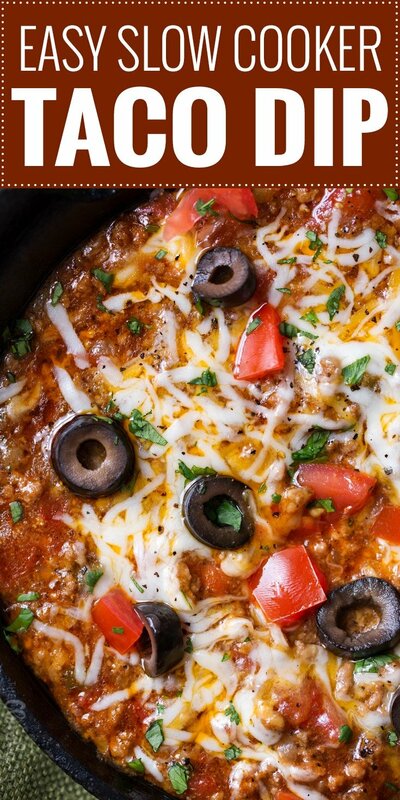 Until then, you’ll have to make do with this incredibly tasty slow cooker taco DIP. Let me tell you, it’s as tasty as your favorite tacos. Plus, this recipe calls for just 10 minutes of prep! I normally chop my veggies as my meat is browning in the pan, so if you don’t like to multitask with prep, it may take you 15 minutes… but after that, it’s nearly completely hands-off! HOW IS THIS DIFFERENT THAN OTHER TACO DIPS? I mentioned using homemade taco seasoning, which I encourage you to try, at least once. Everyone has their own tastes, but my homemade blend is one that my family has been enjoying for years! You can easily double or triple the recipe and store it in an airtight container with your other spices for other taco nights to come. However, if you already have a packet of taco seasoning, go ahead and use that. Use whatever ground meat you prefer. I use beef the most, but turkey is a fabulous (and healthier) substitute! 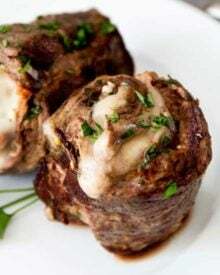 If you know your slow cooker runs hot on the HIGH setting, go ahead and spray the inside of your slow cooker insert to keep the dip from sticking. For the toppings and garnishes, go for whatever you like on your tacos! I kept it simple here with tomatoes, olives and cilantro… but red onion, avocado, guacamole, corn… it’s all fair game. I find this dip to be convenient for a party, since it doesn’t take up precious oven space, but if you prefer, there’s an oven version down in the recipe card itself. This game day season (or any time really), dust off your slow cooker and give this ultimate taco dip a try. It has everything you love about great beef tacos, in a fun dip form! 4 quart slow cooker – this is the slow cooker pictured here in the photos, and I LOVE it. It cooks like a champ, has an insert you can brown things in on the stovetop, and cleans up so easily. However, it’s not cheap, so if you’re looking for something more affordable, the one below is fantastic option! 3 quart slow cooker – this dip fits wonderfully in a 3 qt slow cooker as well, and this one is incredibly economical, yet works really well! 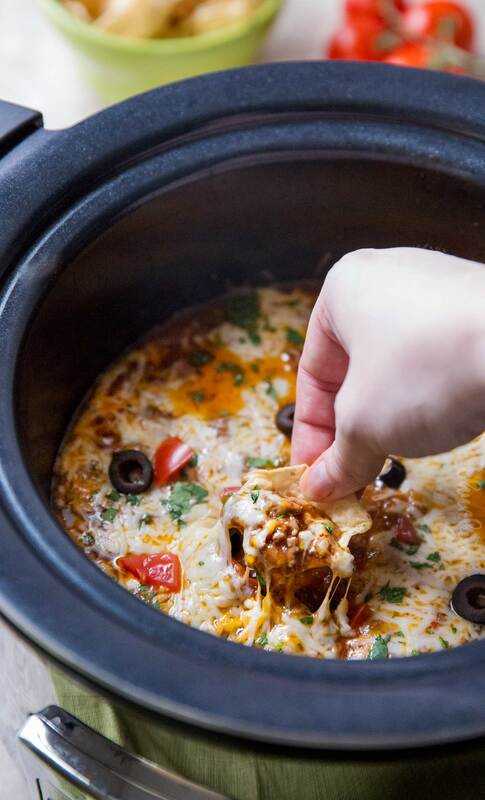 WANT TO TRY THIS SLOW COOKER TACO DIP? Heat a large skillet over MED-HIGH heat and drizzle with a little bit of olive oil. Add ground beef and cook 3-4 minutes, crumbling as you cook, until mostly browned. Add in diced onion, poblano and jalapeño and cook about 2-3 minutes, until soft. Drain grease. To a 3-4 quart slow cooker, add cooked beef mixture, beef broth, cornstarch, taco seasoning, and diced tomatoes with green chiles. Stir to combine well. Cover and cook on HIGH for 3 hours, or LOW for about 5 hours. 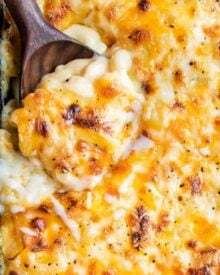 Remove lid, add half the shredded cheese, give it a stir, top with remaining cheese. Cover and cook on LOW for 10 minutes, or until cheese is melted on top. Sprinkle with garnishes and serve with tortilla chips! Preheat oven to 350 F degrees. Complete step 1 above as directed, preferably using an oven-safe skillet. After draining, return beef mixture to skillet. 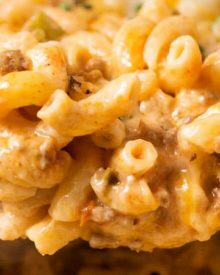 Add beef broth, cornstarch, taco seasoning, diced tomatoes with green chiles, and half of the cheese, stirring to combine. Sprinkle with remaining cheese, cover loosely with foil, and bake for approximately 20-30 minutes, until bubbly and cheese is melted. Garnish and serve as directed above. If you're a bean fan, a small can of refried beans or drained and rinsed black beans can be added to the dip as well. If you don't want to make the homemade taco seasoning, use your favorite brand's seasoning packet. It says to add 1/2 of the cheese, but never tells you when to add the other half. Did I miss something? The next few words in step 3 say to add half the cheese, stir, then add the remaining cheese on top. Is is two cans of tomatoes and two cans of green chilis or two cans of tomatoes with chilis….like rotele? It’s two cans of tomatoes with green chiles, such as Rotel brand. Could I make this in an 8 quart slow cooker? 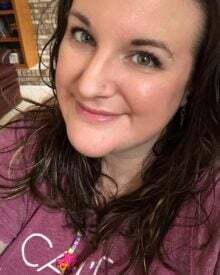 I am obsessed with tacos AND dip so I know the two together will be unbelievable! Thank you for sharing this!!! Is this dip spicy/hot? It was a lot of peppers and I am worried that it may be too spicy. I don’t mind spices or flavor I just prefer things mild. If it’s spicy, any recommendations on how to make it mild? Did you drain the tomatoes going into the beef mixture? I put the cornstarch in but mine was still kind of soupy. Not sure what I did wrong. I took it out of the crock pot and baked it for 10 min and it fixed it.. 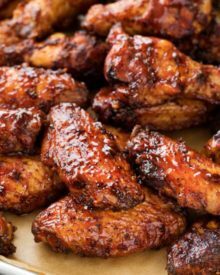 I was looking for appetizers to make for the Super Bowl and found this recipe. It looks amazing! I’m afraid to show this to my husband. He’ll want me to make it for him RIGHT NOW. Lol! Oh my gosh! This looks so good! I have to make it for the Super Bowl! 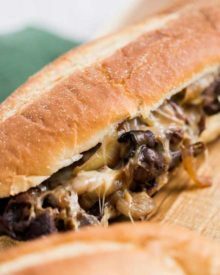 Love how easy this is in the slow cooker! 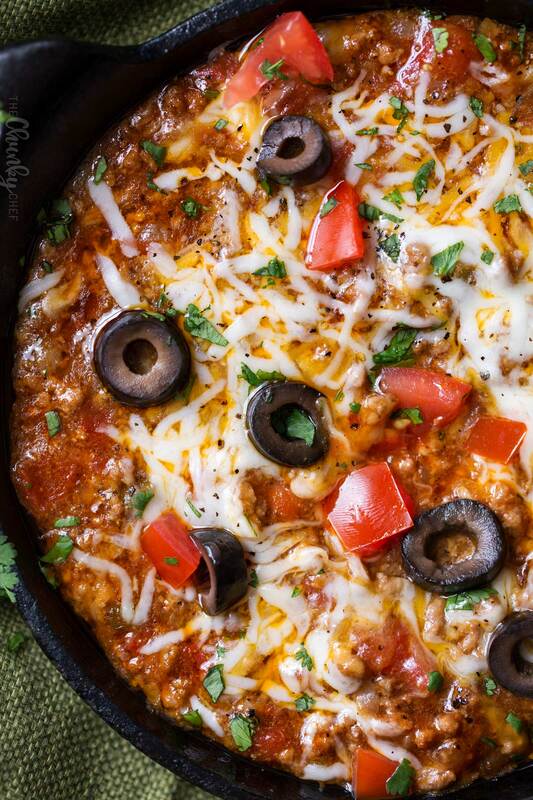 This taco dip will disappear fast! Totally serving this during our Super Bowl party! Perfect for a Super Bowl party!! This is perfect for game nights! This looks amazing, and it’s perfect for game days! 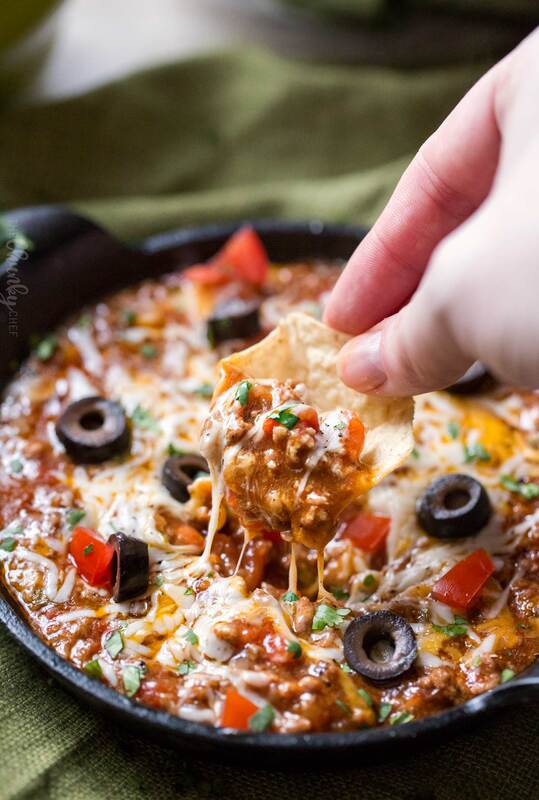 I love slow cooker dips for parties! 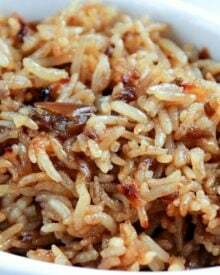 I’m sure friends and family will gobble this up fast!